Yo specialises in Shiatsu Massage and has been with the clinic since 2004. 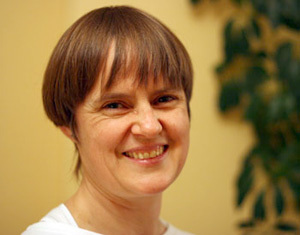 She practices, teaches and enjoys Shiatsu and feels it is a great way to relax. She initially became interested in the subject when she was working in a stressful job and looked for a therapy that would help. She took some regular classes and became interested in doing her own massage as she felt it helped her a lot. Yo studied at the British School of Shiatsu for three years, completing the course and going on to a post grad course at the Healing Shiatsu Education Centre, gaining a DIP HSec. She also has learned around her subject, study and researched Ethics in Therapy. Before working at Maple House Clinic, Yo worked in Nottingham Natural Health Centre and Gedling Clinic. She has picked up valuable experience in Shiatsu Massage throughout her time and enjoys treating her clients. Before studying Shiatsu, Yo was a Social Action Broadcaster and enjoys caring for people. t. 01773 530268 | e: info@maplehouseclinic.com. © 2019 Maple House Clinic | Sitemap | Initial website design by Floor9Design. Maple House Clinic is convenient for Eastwood, Nottingham, Derby, Mansfield, Ilkeston, Chesterfield, Leicester, Belper, Heanor, and most of Nottinghamshire, Derbyshire, Lincolnshire and Leicestershire.